Info "I can handle even the worst bugs as long as I have the right tools. Grab it… Gently…"
Buggin' Out is one of Orbulon's Microgames in WarioWare: Smooth Moves. The player must grab the bug by opening the pliers with the controllers. The player must first open it and then close it when the bug gets at the right spot. 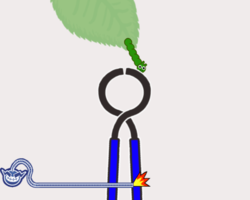 1st level difficulty: A swinging caterpillar. 2nd level difficulty: Falling shrimps. Any of the shrimps can be caught. 3rd level difficulty: Falling centipede. Only one chance to catch this. This page was last edited on February 20, 2018, at 18:17.